The kiosk houses a computer with a touch screen for a golf driving game called Target Golf. The customer wanted something a bit different but stylish looking so that they can export the concept of this game. Tru-tech Fibreglass was commissioned to design and integrate the screen & computer. 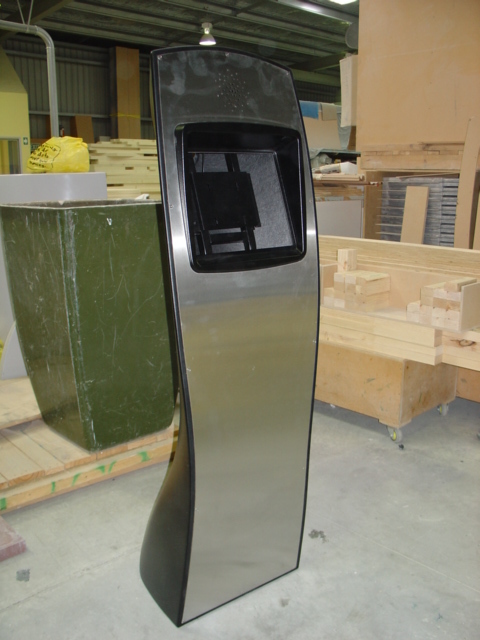 The front panel is stainless steel with the black portions being fibreglass spray painted black with a texture coat. The unit has an internal metal frame with a small fan mounted in the top to draw air from a vent in the bottom over the computer for cooling. The Target Golf is set up in an Auckland golf driving range. Below are a series of pictures for the pattern making process. The pattern is then used to make the mould from which all article are then made. For more information on custom building a fibreglass product give Brendon a call at Tru-Tech.